Artwork from the Mother vinyl’s bonus booklet, by kenisu3000. In 2015, the indie record press Ship To Shore Phono Co. put out an officially-licensed pressing of the soundtrack to Nintendo’s beloved RPG Mother, which had just been released that year in the U.S. as EarthBound Beginnings. I backed it on Kickstarter (obviously!) and a representative from the company then reached out to ask if I wanted to write some liner notes for the album. Of course I did. I took such a weighty assignment as seriously as you might imagine, playing through the game and doing a lot of research about the album itself, which included arranged recordings of the music alongside a medley of the original 8-bit tunes. The album is currently sold out, although it might be coming back one day. (Ship To Shore went on to produce a vinyl pressing of the Mother 2, or EarthBound, soundtrack, which is back in print now). Since these liner notes have heretofore only been available on the printed booklet included with the original vinyl, we wanted to put them on the Internet for the first time and share them widely. So here’s my written tribute to the music of a landmark game. I am part of the Mother generation. When Shigesato Itoi built his role-playing game that took place in a Tokyoite’s imaginative, romanticized version of suburban America in the late eighties, I was nine years old and living in the real thing. The precise moment in time captured by Mother’s game design is what I lived in. It was late enough that everyone carried around ATM cards, too early for anyone to have a cell phone. You could still wander around the neighborhood with a toy gun. 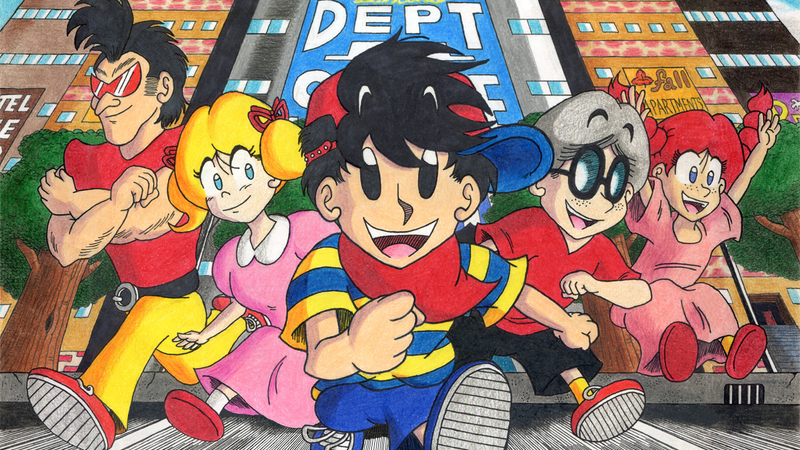 But those of us to whom Mother might have been particularly relevant never got the chance to play it, since it wouldn’t make it outside Japan until 2015, when it was released as Earthbound Beginnings. So we finally have Mother, and today we also have what you hold in your hands, an album of songs and instrumentals based on the game’s impressive musical score. The “Famicom boom” in Japan was in full swing in 1989 when Mother was released, and in particular, the RPG had risen to prominence thanks to the huge success of Dragon Quest and, later, Final Fantasy on Nintendo’s platform. It is a testament to the mainstream nature of these games in Japan that talented artists from outside the gaming industry—like Itoi, a well-known essayist, lyricist, and actor—were banging down Nintendo’s door wanting to work with them. Mother was something of a commentary on Japanese role-playing games back when the JRPG was a brand-new concept in and of itself. By switching the focus from medieval D&D-tinged fantasy to something closer to real life, Itoi brought games a little bit closer to art, a little bit closer to being that mirror that shows our humanity back to us, leaves us a little bit different than it found us. On the game’s back cover, Itoi asks us, in an attributed quote, to play Mother slowly and leisurely. (There’s a reason the game’s characters rejuvenate their hit points by walking into a hot spring and waiting for a few seconds.) Itoi wanted us to experience the whole world, not just rush through. Surely he wanted us to luxuriate in the game’s music, which in addition to providing a comfortable, relaxed ambience to the game, plays a pivotal, ever-present role in its storyline. Itoi had brought in another outsider, rock musician and composer Keiichi Suzuki, to score his game’s world, working alongside Nintendo composer Hirokazu “Hip” Tanaka. Suzuki also arranged most of the tracks as they appear on this album. “Arranged albums” containing live versions of game chiptunes were not so strange even in the 80's in Japan, so this Mother album was hardly out of the ordinary. Its emphasis on vocal songs written in English was certainly a little weird even by the standards of its day. What Itoi and Suzuki seem to have been going for was an extension of the metaphor; their game about American kids had an album sung in great part by… well, English-speaking kids, anyway. As the soloist for St. Paul’s Cathedral Choir in London, Budd was pretty much at the top of the treble game; by 1990 he’d have his own album out on Hyperion and in 1991 he was the boy soloist for Paul McCartney’s Liverpool Oratorio. On this album, he’s our singing stand-in for Ninten, boy protagonist of Mother. Mother, the album, may strike you as a little bit different than what you expect, especially if your main avenue of engagement with this music has been hearing it while playing Super Smash Bros. Melee. It’s a little eccentric; the way that the English words land on our native ears will of course be different to the way it would have been perceived by its intended Japanese audience. But take Shigesato Itoi’s advice: Listen slowly, patiently, find a favorite track and loop it, and you’ll find that Mother will grow on you.